So we pick up the story after the first day of racing; Si and I are in 44th position overall, counting a first position and a last, after our mast came down due to the strong conditions. We were pretty angry and annoyed that this had happened to us of all people, knowing that we had done everything to prepare for this event and it was a piece of equipment (a brand new 3mm shroud pin) that had let us down. However, fixing our boat (the mast had sheared off at the deck and we had to refit a whole new mast step, with the invaluable help of my Dad) late into the night gave us some thinking time, and I guess we decided to just pick up where we had left off. We knew what we needed to know, that we were the quickest boat out there and were sailing beautifully! All we needed was a few more races in the series and a discard and we’d be right back up there at the top of the leader board. However, we absolutely could not afford any more bad races, or any more discards, and had to now sail right on the edge to gain back those lost points. To win we basically had to sail the perfect series from here on.Day two dawned just as the others had, a little bit foggy and with a light breeze, which stayed for slightly longer than it normally does. We were racing first this time and so got ready much earlier. As you can expect, we checked the boat and the pins about three times! We set the boat up with light wind settings as we expected the breeze not to get up above 10 knots for the morning session. We would then come in after two races, let the other fleet sail their share of races, and go back out for two races in the big stuff. Sailing out to the course for the first session was easy, and the first race was an absolute cracker. 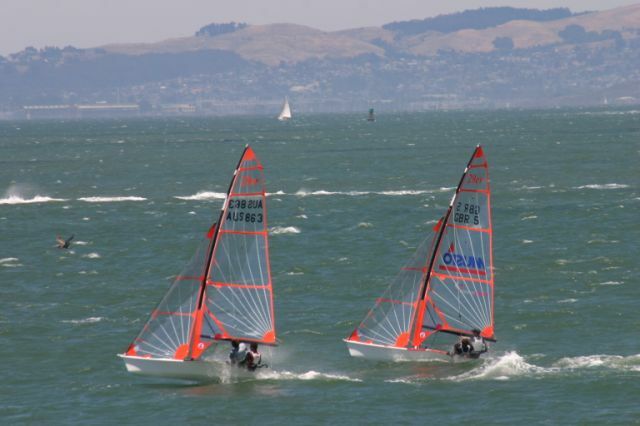 It was about 10 knots, with a heavy flood tide, so we started mid line and sailed with height to the shore. At this point it should be noted that Si and I were one of the heaviest teams in the regatta (one of the reasons we were pretty quick in the heavy wind, along with knowing how to make the boat go fast! ), and so we really weren’t supposed to go that fast in ten knots. But we were rapid and extended our lead to around half a leg by the finish. We then sailed a carbon copy in the next race and won by the same distance! I can probably say that these two races were the most rewarding of my life; after what had happened the day before, people may have thought we would have gone into our shells, but we wiped the floor in winds that were apparently not suited to. We went back pretty darn happy.As expected, the winds for the afternoon had picked up a lot. We changed settings and sailed out, and started the third race of the day. To our disbelief, and increasing giggles, we were again at the front! However, we were racing a good group and couldn’t quite extend, and so finished third. Still, a great race and we were getting back in there. The last race of the day was the same as the first race of the competition, and we won by quite a distance. We were excelling in the conditions and not making mistakes, and I hope that the other competitors were thinking what they had to do to beat us. It was a pretty good feeling getting back in to slaps on the back and lots of congratulations.The second day of racing was just amazing, and it put us from 44th on the leaderboard to 1st in one big jump. On top at last! We just needed a few more solid days and we could actually win, but there was a long way to go and anything could still happen, from capsizes to disqualifications… Ah yes, disqualifications…Day three wasn’t great by any means. A fickle wind blowing meant a truly dodgy race first thing, and somehow we managed to capsize upwind whilst in a big pack of boats, due to the wind hitting us from all directions off the land and the clubhouse. We finished around twelfth, an OK result but not great. Race two turned out to be even worse, even though we finished a very good second. Our attitude through most of our sailing was to be slightly risky and to push the starts quite hard, to get the most advantage. It seems like in this race we pushed it a little far. Coming through the finished line, where normally you get a finishing ‘beep’, we were greeted with silence. Whoops is an understatement. Obviously disqualified from starting prematurely on a black flag, we went back to shore to find out the bad news in writing. After these two bad races, we were 11th overall, but one race off getting another discard (which would move us back up to 2nd). Two races were left in the qualifying series, to be held that day, so we thought we’d be fine (boats take their finishing position in the qualifying series into the final series as a race score, so it’s vital to qualify well). However, to our astonishment the race committee canned the rest of the racing, one race shy of the discard, due to “heavy winds”. You have to be joking! Heavy winds the reason for not sailing in San Fran?! They didn’t seem too heavy, nothing that we haven’t previously sailed in. We were stunned, needing another discard to take two points into the final series rather than 15th. But nothing changed and we stayed 15th. Annoyed at ourselves for being disqualified, where all we needed to do was get a solid last two races, we now had to fight back again (something we were again confident to do). Maybe all it would have taken was a calming word into our ears before that first race of the day, and we would have sailed a modest race. Live and learn. (However, due to the way San Fran has to be sailed, with strong tides, you either get a cracking start and reach the shore first, or you get screwed and finish near the back, a risky tactic we had employed from the beginning to good effect).So, we went into the Final Series in the Gold fleet (for the third consecutive time in the 29er) in 15th position, needing to sail the remaining seven or so races brilliantly to win the title. It was becoming harder and harder, but we were still confident we could do it.Final part follows soon! We’re trying to get some interesting reading material here to keep you coming back for more. I’ve recently persuaded Justin to write a few stories from his 29er days. 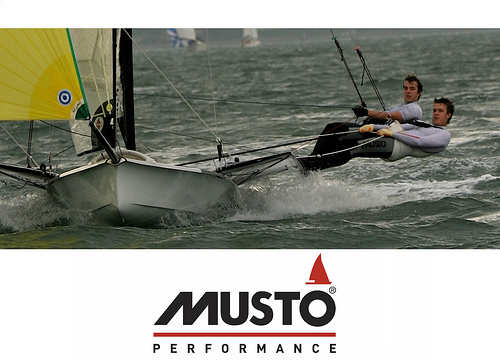 The first report will be about the 29er Worlds 2005, which he managed to win his Youth World Champion title at. 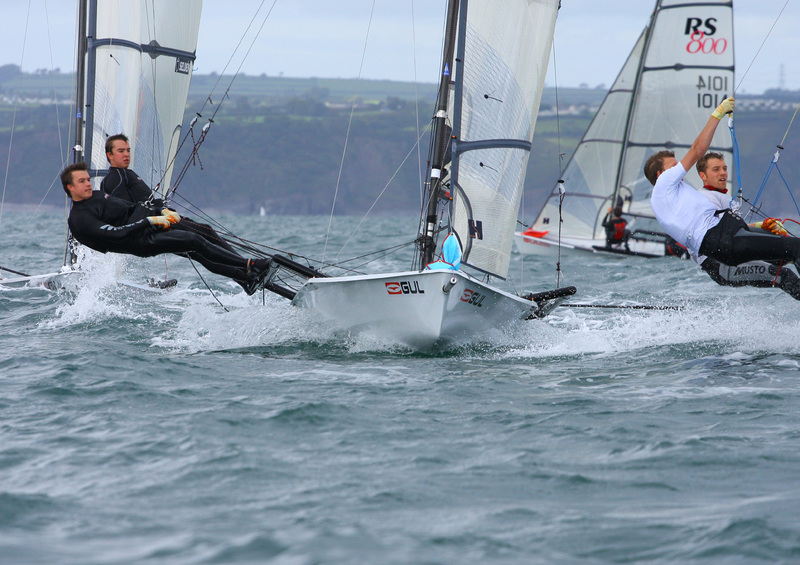 This is a must read for any 29er sailor, and relevant for all skiff sailors. Look out for it over the next few days. We hope you enjoy it.